Ableism is the idea that we all expect every human to meet certain norms and standards of ability. In practice, this means that we expect everybody to be able-bodied and able-minded at all times. In fact, recent trends of performance enhancement via medication and technology have led to expectations of the body and mind that go beyond what is “normal”. And if somebody does not meet these expected norms and standards, then they are considered as failing. This is an ableist attitude. What is ableism in the curriculum? This ableist attitude filters through every aspect of society and as such also affects classrooms and indeed the curricula. Ableism in the curriculum is reflected in the way we teach and the way we assess. We lecture using powerpoint slides, we ask for written assignments, we expect students to be good at English, good at reading and writing, able to get up for studies at 9 am and to be able to stay seated on any chair for several hours. Ableism in the curriculum is about access to learning for all. 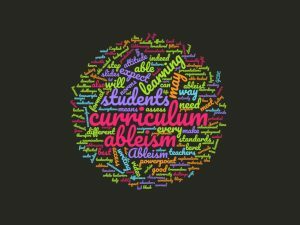 What can we do to address ableism in the curriculum? As teachers, we can make sure that we allow all students to access the learning materials in what is the best way for them. This may be audio- or video recordings, or transcripts of explanations and lectures. This may also be having powerpoint slides with a colour scheme other than black writing on white background. This may be descriptions for images. This may be looking at how we assess – is an essay really best or could we have presentations, blogs, video productions or even let the students choose how they want to demonstrate their learning? Addressing ableism in the curriculum basically means to create an environment where “deficiencies” are not seen as less valuable or deviants, but as different ways for learning. Some strategies will actually not make any difference for most of our students, but for some they provide tremendous help – and that is what we need to focus on, so that nobody has to stand out. What are the challenges in addressing ableism in the curriculum? Of course, there are formal constraints, such as GCSE and A level examinations. At university level, too, there are formal requirements for programmes. And indeed, as teachers, educators and lecturers we need to prepare our students for the real life of employment. So we will not be able to eradicate ableism in the curriculum entirely. We will need to continue to set deadlines, and essays, but at the same time, we should become more aware of potential, different options. The challenge therefore lies in navigating these tensions. But every little step taken, is a step in the right direction.